Inspired by Terry Hall. Military 2 Face collection. 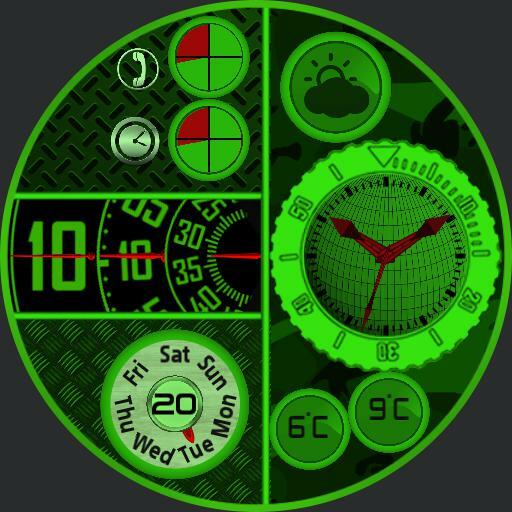 Face 1, right Analogue time, weather icon and condition, temperature dials low and high degrees C.
Left side, rotating hour, rotating minute and second dial, markers, power levels for watch and cell, Rotating date, short day with marker, day number, , . Tap actions. Dim mode Face 1 time, analogue and rotating time. Watch name Military, UK made. Face 2 Cover. Military icon. Tap actions, centre to swap faces.